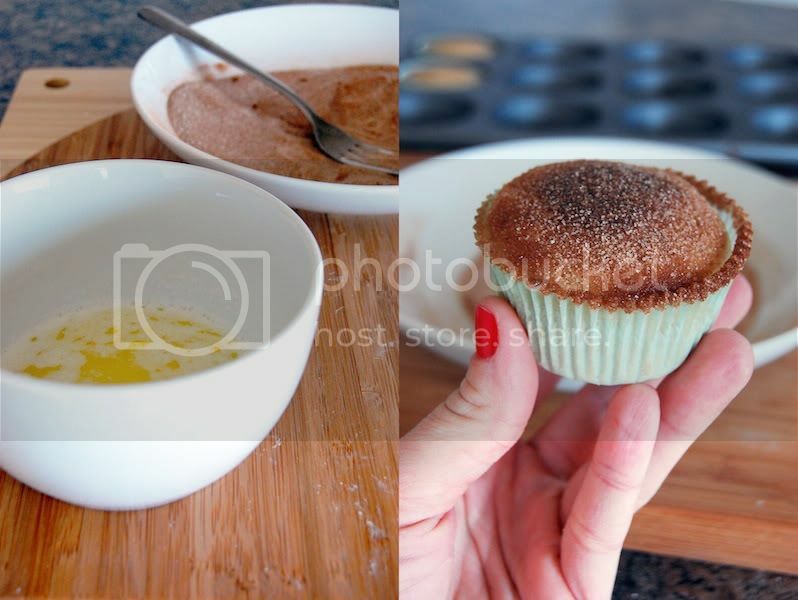 girl who bakes: cinnamon sugar donut muffins! these donut-muffin hybrids (duffins? monuts?) may not be the most beautiful things to come out of my kitchen, but they sure are some of the most delicious. seriously, they're tied with my new favorite leave-in conditioner for "things that have completely rocked my weekend." 1. you don't need any fancy kitchen gadgets to make these, just a few bowls and good whisk. sometimes i dread lugging out the stand mixer and consider mixing ingredients together a form of exercise. well, it kind of is! strength training? anyone? 3. they are totally kid-friendly and come together in an hour. none of the pesky waiting around to start enjoying cinnamon-sugary bliss. 5. last but not least, they are 100% delicious and perfect at any time of the day. also, who could turn down a DONUT shaped like a MUFFIN? i know you probably haven't made it to the end of the list without running to your kitchens to throw this together, but i'll continue with the post for when you come back, donut in hand. though i don't consider myself a "low fat" or "light" baker, i do have a few tricks up my sleeve on how to cut some of the unnecessary bad-for-you ingredients from baked goods. one great trick is substituting unsweetened applesauce for oils, which i did in my modified version of this recipe. to use this technique, just put however much applesauce your recipe calls for in a sieve over a bowl and let it sit for 15-20 minutes. gravity will pull the majority of the moisture out of the applesauce, which would otherwise make your final product overly runny. if you don't have a sieve, you can mimic the effect by putting the applesauce between several layers of paper towels. it's a little messier, but it works! these babies puffed up a lot, so i was glad that i only filled the tins up halfway. i used paper liners for the bigger version of the donuts (i ended up making minis too!) because i'm taking them to work and feel weird handing out unwrapped baked goods, but i think it takes away from their beauty a little. 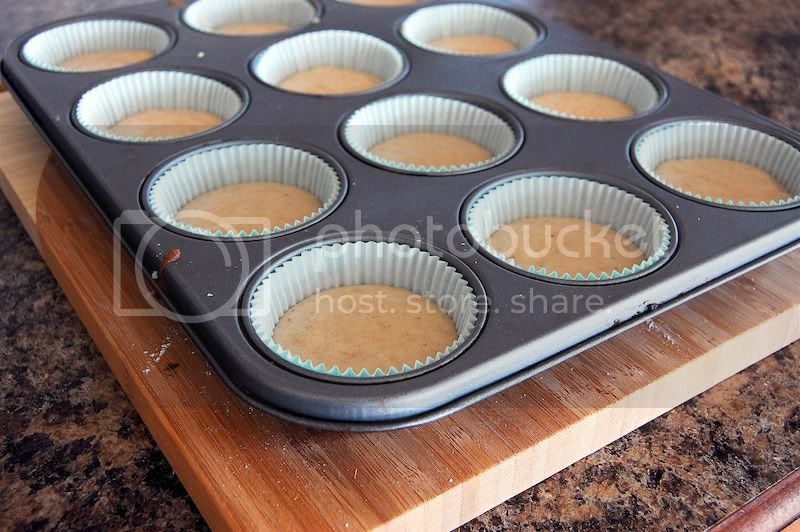 feel free to scrap the liners and just give your muffin tins a good spray before adding the batter. another way i cut the calories from these was by not submerging the entire donut in butter before rolling it in cinnamon sugar. instead, i just dunked the tops! i don't feel like i lost any of the effect or taste at all, but you can feel free to coat your entire donut if you're feeling crazy. this recipe was so easy to make and would be a quick and easy brunch treat to whip up some lazy morning. 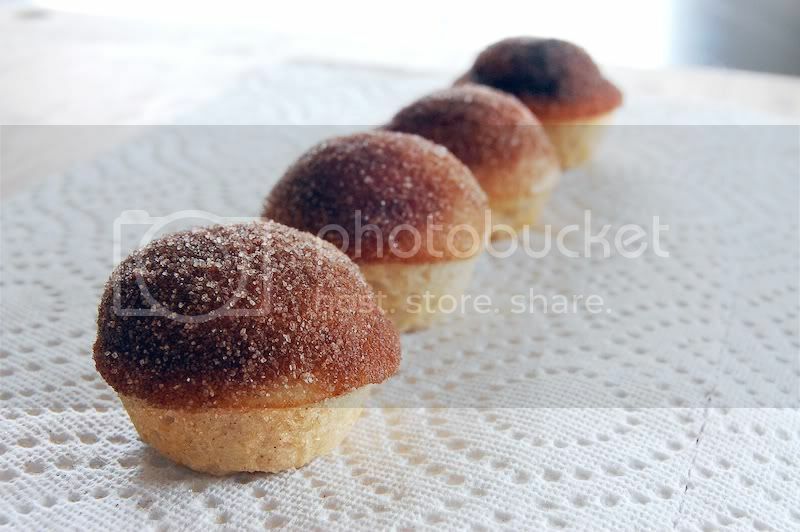 they are also super versatile and could be just as easily glazed or stuffed with jelly - my personal favorite. the few substitutions i made didn't detract at all from the flavor or taste, but instead just cut the calories down from 275 to 162 - an enormous difference. 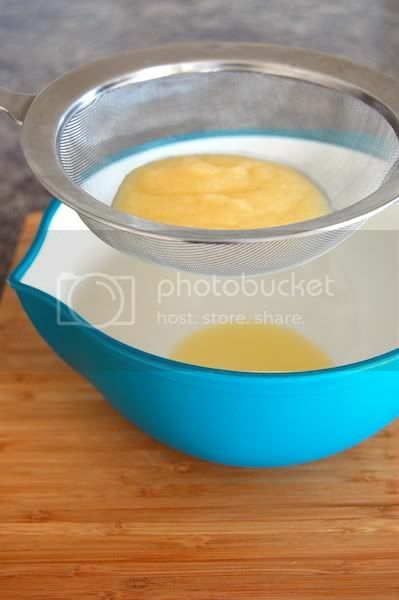 1. strain applesauce via sieve or paper towels for 15-20 minutes. 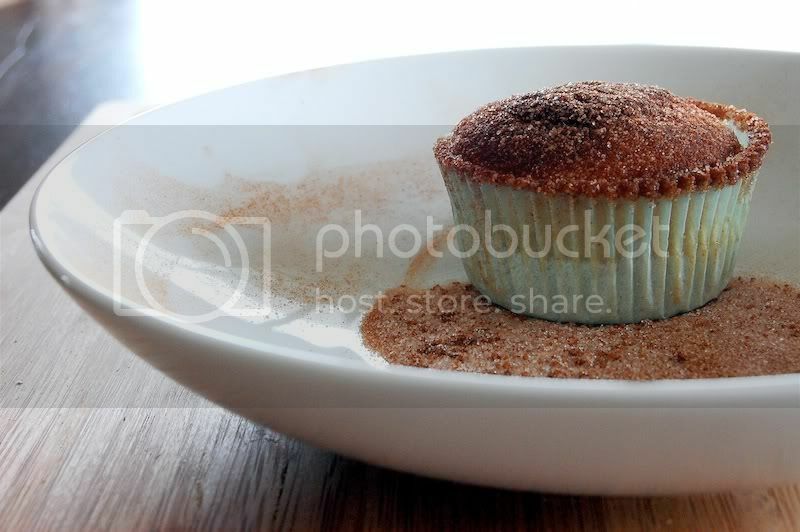 2. combine flour, baking powder, salt, nutmeg, and cinnamon in a bowl and set aside. 3. in a large bowl, whisk together applesauce, oil, sugar, egg, and milk until combined. 4. slowly add dry ingredients to wet ingredients and whisk together until no large lumps remain. 5. scoop into muffin tins and bake at 350 degrees for 15-17 minutes. (mini versions only need to bake for 7-8!). do not over-bake! 6. while your donuts are baking, melt butter in a heatproof bowl in the microwave. in a separate dish, mix together sugar & cinnamon until combined. 7. take donuts out of the oven and let rest for 1-2 minutes. while still hot, shake out of muffin tins. dip tops into butter, then sugar mixture, then let dry on wire rack for 5-10 minutes. calories: 162, fat: 3.25g, cholesterol: 21mg, sodium: 159mg, carbs: 30g, fiber: 1g, sugar: 16g, protein: 2.75g. before i go, i'd like to say a quick "thank you" to all the new readers that have been visiting my blog recently. welcome! if you have any questions, comments, suggestions, or requests, please feel free to get in touch via comment or at girlwhobakes@gmail.com. 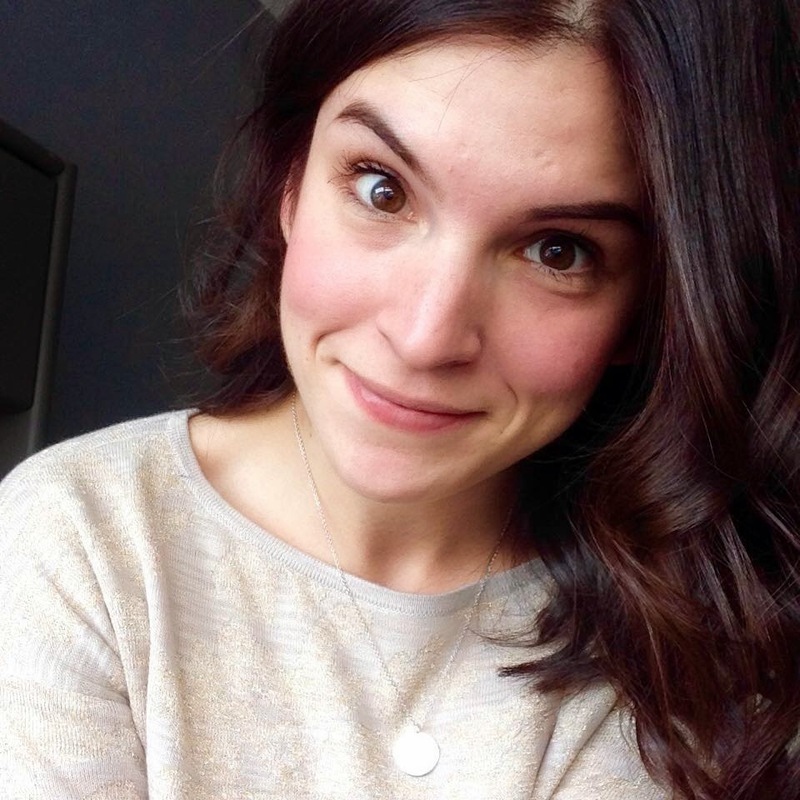 also, if you would like to know more about why i started this blog, or why i have all the nutritional information listed for my recipes, please check out my first entry right over here. as always, thanks for reading & happy baking! I've made these before, but full blown version (fully bathed in butter)and all I can say is they are just WOW! Now that I know how good they are we have to double our batch, my kids make them disappear pretty darn quick. I really like your modifications to the recipe (very clever), going to have to try it out, see if they notice any difference. CarinE: they are much more like cake donuts, which are actually my favorite! AvaDJ: i'm sure the full blown version are incredibly decadent! i might have to make them for a special occasion or something. thank you for your compliment & let me know if your kids notice the difference! I looked at this recipe this morning, and when I got home from work I made these. I ended up using my new mini muffin pan, it took me 35 minutes start to finish, super easy and delicious! I was scared to overbake (didn't want little bricks) So I checked every minute after 5 minutes, They took 8 minutes total and came out perfect. I'm sure that time will change depending on pan sizes. I can't wait for my guy to get home, he is going to love them I'm sure! Thanks for the recipe and inspiration, I've been seeing little doughnut pans all over the place and bloggers showing off their pans... I nearly bought a heart shaped one from sur la table for their valentines day sale... but I'm on your side about tools that have a single purpose. Thanks! victoria: i'm SO glad they worked out for you & thank you for sharing your story with me! i won't lie to you, i may eventually cave for a mini donut pan if i can score it for cheap enough, but no way this girl is paying full price! This is an awesome recipe!! I can't wait to try it =D Looks soo good. So I made these last night and they were just gobbled up ferociously by my family. No one noticed any difference from making them the original way, so definitely a success! I actually preferred them with the applesauce too rather than oil. I had to hide enough of them to save for lunches today, otherwise all gone. My friend made this for his wife's birthday today and loved them (and pointed me here via Facebook). I'm totally making these one day soon. j: thank you so much! and please thank your friend for forwarding you here! you could TOTALLY dip them in chocolate. either straight up melted chocolate or even a nice glaze. divine! I just discovered your blog and am LOVING it. I can't wait to try this recipe. I am getting hungry just looking at it. I love the beautiful pictures - I am defiantly visual. I really like that you make delicious food healthier and I love the commentary! We have applesauce, but I believe it's sweetened. How will that affect the way these little donut cakes turn out? These were amazing!!!! Thank you so much for the recipe! I made these vegan by substituting a small banana for the egg and soy milk for the cow's milk. Also, since I didn't have nutmeg I used 1/4 t allspice and 1/4 t cloves instead. Good stuff! baypo - I was wondering about using margarine instead of butter for the topping. Did you substitute that as well? I made these for a Saturday morning breakfast in January and they were so delicious! I was craving cinnamon rolls and these filled that. The applesauce is what makes it taste like a muffin so you could put fruit or fruit jam. If you using jam, I would reduce the sugar in the recipe down to 1/2 a cup. Any fruit jam would be a good substitute for applesauce.